Anything with the headline of "filler" should make any serious anime fan cringe. To the laymen, they are usually unaware if filler is in front of their eyes, but as they begin to ponder the unnecessary plot devices poking around in their favorite long running shows, common sense paves the way. I understand the point of filler. If we are getting down to brass tacks here, filler is just a way of making money. Of course it keeps the shows interest high to its certain demographic, but it's there to make some more money. In my opinion filler is designed to control fans. Studios must think that If we give a show half the attention it deserves, the anime community is too starved and stupid to say no! They'll pump as much content as they want to produce until it catches up with the manga. If a show is good enough, I think the public will wait around for more…not cheap substitutes. Lonecow and myself both got into Bleach and Naruto at the same time. We also told ourselves we would never watch those shows again. The filler in both was too depressing, and if you followed those shows when they were interesting (and stayed true to the manga), it makes a total joke of the protagonists early adventures. Remember Naruto when it took you a long time to use Rasengan? In filler you can use the Rasengan and eat a bowl of ramen at the same time! Bleach and Naruto are shows that are too easily recognizable for their filler blunders. I'm still cleaning my toilet after experiencing the Bount arc. I'm here to briefly talk about one of my favorite shows that experienced horrible fillers. The OVAs are nothing short of terrific, but I have a soft spot in my heart for the first two seasons. I watched Rurouni Kenshin in the middle of my turn from novice fan, to dedicated consumer. I remember almost every day, I'd watch five to six episodes , eagerly anticipating the next. The show had the right amount of action, interesting characters, and cheesy moments. I even appreciated how the show blended history and fantasy. That all came crumbling down after season two. Instead of even trying to convey a cohesive story, the series turned into a slice of life. It was terrible and insulting. I remember when I saw the Pelican Brief at the dollar movie with a friend when I was 12. Yep you guessed it, I had no idea what was going on. It was the same with Rurouni Kenshin filler. 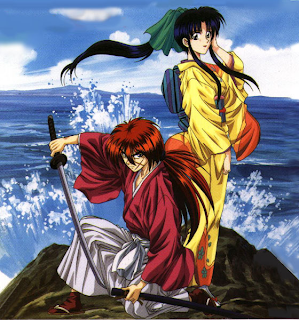 Kenshin was just a shadow of the character you grew to love in the beginning, and all of the other that the series worked so hard in the beginning to develop, became jokes. Even his relationship with Kaoru became dreadful. Throughout the first 62 episodes, you couldn't peel me away from the television. After I got into the meat of the fillers, I couldn't count the number of times I fell asleep. We have to look out for one another. We can't let people waste their time like that. For example, if any one out there is watching InuYasha, please stop. You want to know the true Battosai? Watch this excellent series, but don't go past episode 62. You've been warned. P.S. I loved the opening for the first season. Enjoy.